I have been thinking recently about how writing something effective is often about a structure and how I could get students to be more confident and assertive in their writing and decided to try something different. A good essay for me is often one that provides multiple, often conflicting perspectives and then offers some kind of possible synthesis. Too often I read stuff that just sounds like something the students think I want to hear or a very linear essay which contains a ‘right’ answer. In order to combat this I tried formalising a possible essay structure by invoking Hegel’s dialectic model of thesis, antithesis and synthesis. I wrote out 5 possible critical positions relating to Hamlet in triangles, gave them a bunch of post-it notes and then asked them to discuss possible ideas. The type of ideas that students came up with really interesting, and in small groups they were easily able to adopt/review various different critical positions. It ended up being one of the most interesting lessons I have ever had. The various lines of enquiry opened by this simple little model proved very fruitful and their essays were far more confident, thoughtful and reflective than what they had been writing before. I teach this structure in my English class, too! One way that I help students grasp the notion is by asking them to apply it to history — American revolution, the Civil Rights movement, etc. I love that you provide them with some sentence prompts, as well. I will definitely be stealing that for the next time I teach this lesson. This is a really great idea. Thanks for sharing! Will definitely float this with colleagues. 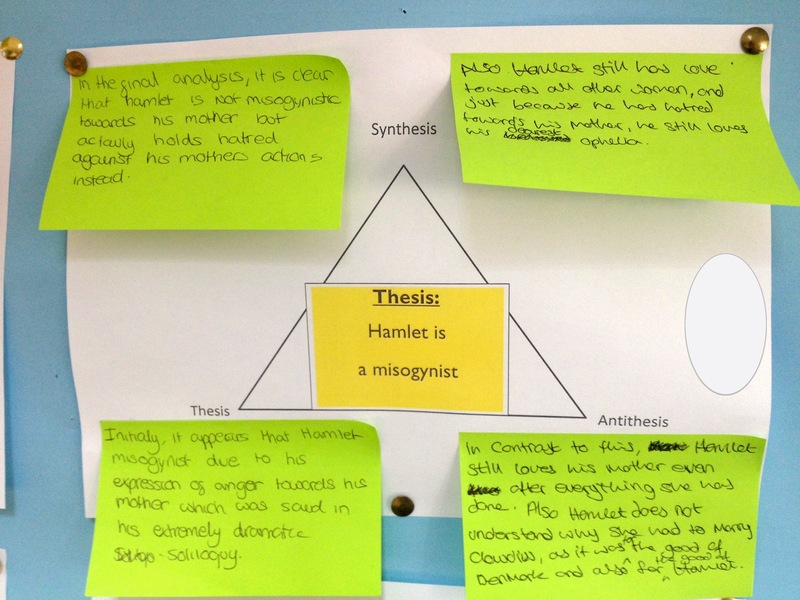 An excellent approach to essay structuring and developing original ideas, using Hegel’s dialectic. Via @C_Hendrick. Forgive my ignorance, but doesn’t the thesis statement here encourage students to think of characters as if they were real people, a la A.C. Bradley? Perhaps another thesis statement about the thesis statement. Apologies, not meaning to be confrontational, but I am wary of making these kind of thesis statement. I’m sure you’ve already taken this into account. Anyhow, I like the encouragement of a system for dealing with different interpretations.